The New York Open returns to NYCB Live, Feb. 9-17, 2019, and we plan to be bigger and better! Though it is hard to believe that it is tournament time again, GF Sports and BSE Global are ready and raring to go to bring excitement and great entertainment value to the community. Fans can count on several of the inaugural New York Open’s signature elements to return. The Black Courts are back, and its place on the worldwide ATP Tour remains exclusive as the only professional tennis championship using the unique surface color. The two-court NYCB LIVE! stadium configuration will once again provide a 4,000- to 5,000-seat capacity, and the one-of-a-kind Overlook (presented by La Croix) is back to offer fans the premium experience to watch multiple matches at one time. The 2018 champion, ATP’s number fifth-ranked Kevin Anderson, and 2018 finalist Sam Querrey are back to respectively defend and seek revenge. The Tennis Channel will telecast more than 40-hours of first-to-last ball action of America’s only indoor championship. And, the New York Tennis Expo kicks the week off with an anticipated return of thousands of fans to experience the free, one-day mini festival of tennis exhibitors, symposiums, ATP player practice sessions and much more. 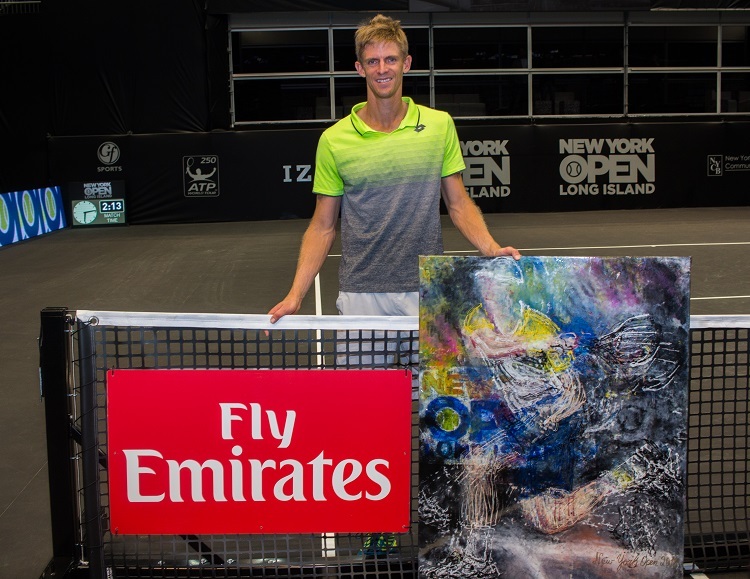 Opening Night will once again feature a cast of legendary tennis stars with this year’s exhibition showcasing Grand Slam champions and Hall of Famers Andy Roddick and Jim Courier. We are really excited about these two popular American former number ones battling each other on the black courts. To give more people a greater opportunity to attend without the worry about work or school the next day, we are scheduling the session on Saturday night, Feb. 9 at 7:30 p.m. 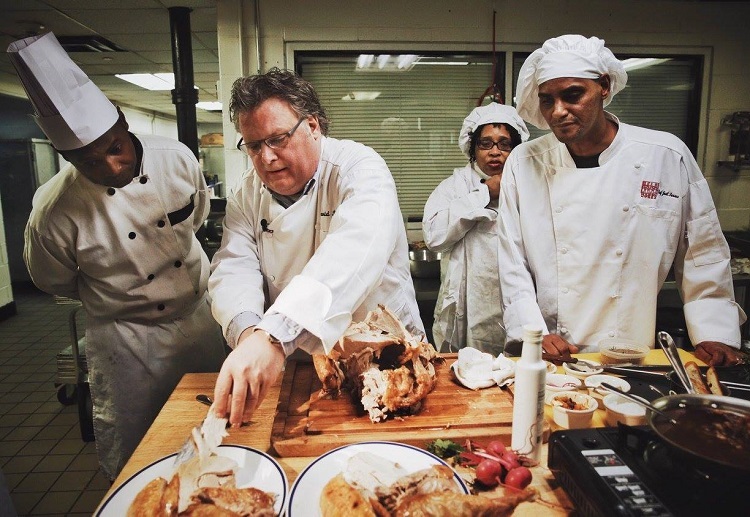 But, our most exciting add for our fans in ‘19 may be the creation of the Taste of New York Open Player Party, starring our Celebrity Chef, David Burke, and co-hosted by his “Executive Tennis Chefs,” Andy Roddick and Jim Courier. The two-hour culinary extravaganza will also serve as the New York Open’s Official Player Party. A tournament’s player party is typically a private event, but we are going to open it up, making the fun foodie experience a major opportunity for 250 guests. For those not familiar with Chef Burke, he recently took up restaurant residence at the Garden City Hotel with his famed Red Salt Room and King Bar. 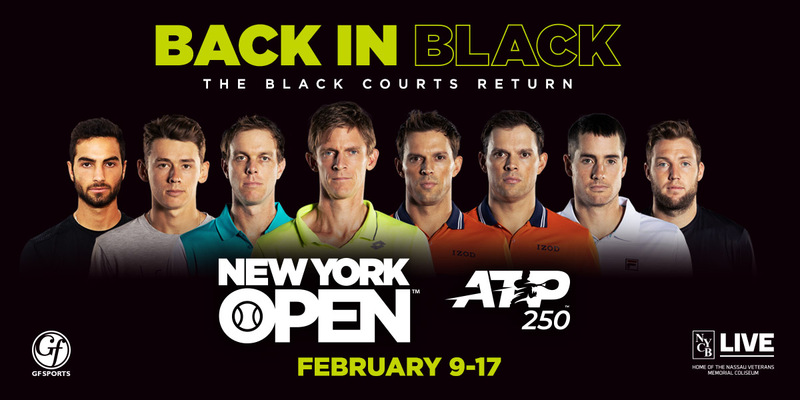 On the court, the New York Open will once again showcase several of the ATP’s top stars. In addition to Anderson, Isner and Querrey, the players that have committed to date include Mike and Bob Bryan, reuniting after almost eight months of separation due to Bob’s hip injury. Mike starts 2019 as the number one ATP-ranked doubles player and Bob is number six, despite being sidelined for the last 10 months. The number two ATP-ranked doubles star Jack Sock will make his debut on the black courts in both singles and doubles, and the same with the 2018 ATP’s Newcomer of the Year Alex de Minaur. Alex will provide New York fans a special treat by pairing with his coach, former world number one Lleyton Hewitt. Coming off his best year as an ATP pro, Long Island’s own Noah Rubin returns along with American stars Steve Johnson and Ryan Harrison. There are sure to be more player surprises and announcements leading up to the tournament so stay tuned. A major new element of the New York Open will be the presentation of immersive, ancillary content and the build out of NYCB LIVE’s Exhibition Hall. If you want to take a break from the tennis action, our New York Open Experience will feature everything from mini-tennis and beach tennis, the official merchandise store, the player-stringing center, sponsors activations, Chef Burke food inspirations, music and more. And finally, the New York Open will present a special pop-up Ninja-course experience, featuring several of the world’s elite ninjas as the Wolfpack Ninja Tour comes to town. Kids and adults will have the chance to see incredible demonstrations, participate in immersive classes and clinics and help raise money for Nassau County Police and the Fire Fighter Museum during a Tuesday night ninja competition. If you have never seen Wolfpack Ninja, then take the time to do so. Thanks in advance for joining us at the 2019 New York Open. At GF Sports, our mission is to produce first-class, world-class professional tennis tournaments here in the United States and by doing so provide up-and-coming American stars the opportunity to perform and shine. Come join us Feb. 9-17 at NYCB LIVE! and be a big part of supporting the sport we love.